I can make small vowel sounds with some effort. Colds! Why so many this year? I almost came to terms with "losing" yesterday, what with us returning a little early and probably would've just spent that day on the road then decompressing. But today? My sunburn seems better, even if my face is still bumpy, but I think today is a write-off as well. Which leaves me with, essentially, just a 3-day weekend and not "the whole rest of Spring Break" that we were crowing about when sitting in bumper-to-bumper LA traffic on Tuesday night. Maybe it's the price to be paid for three-and-three-quarters perfect days of vacation? It was tough to choose between deluxe and first class. 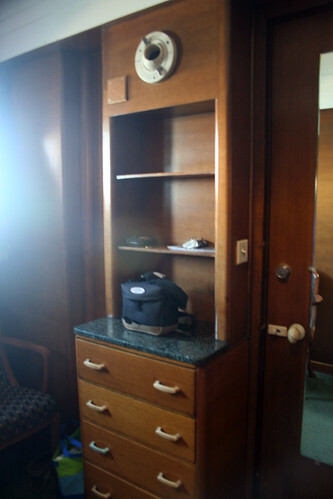 Normally the 1st class room is a little less ($10), but they were priced the same for our "Winter Holiday" package. Okay, it wasn't tough for Mike, who thinks it's peculiar that not every single hotel room in this country comes with a fridge, but it was tough for me. 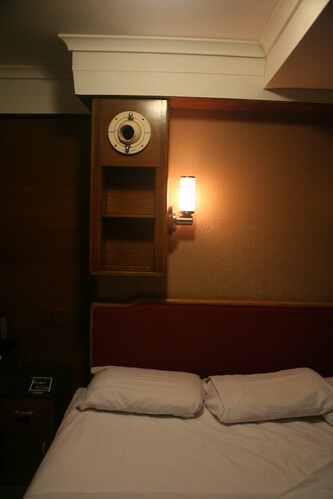 Majority of original decor (for the most authentic experience) or newly renovated with some original decor (for, according to reviews online, the most comfortable experience)? 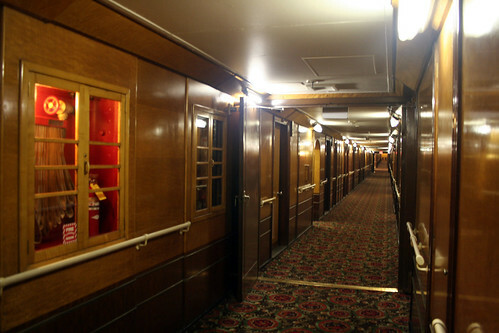 Below is the starboard corridor we faced to our room, M-149. (Possibly known as M-129 back in the day. I'm still researching this.) 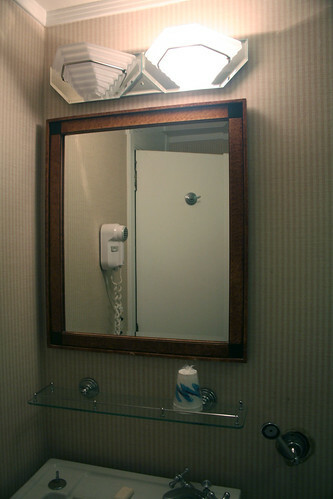 The fluorescent lighting was added as a cost-saving move when the Wrathers took over circa 1980. 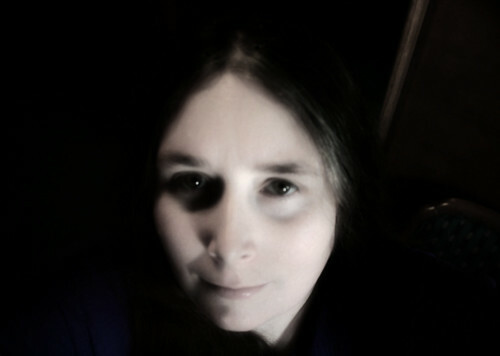 It didn't bother me too much at the time, but it does make for shiny photographs. Immediately we were thrilled, having anticipated something either smaller or more modern. 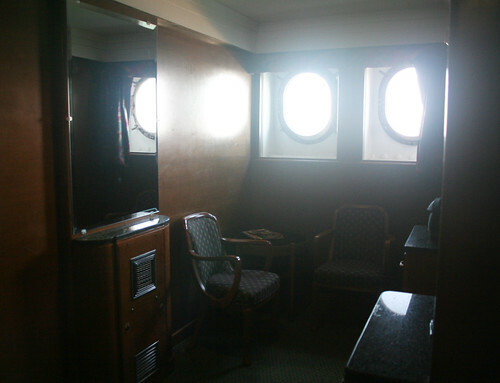 Instead, it was delightfully woody with several original fittings, and two portholes! 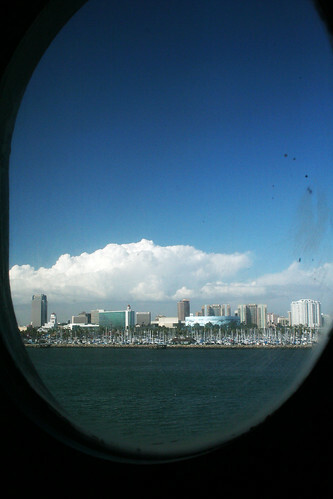 And this is the, uh, view from the other porthole, which seems to be a bit warped, as if sea-demons raked their claws across the glass one stormy night. Ooo! 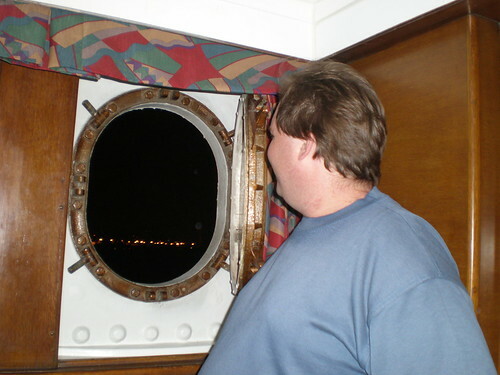 Later, Mike discovered that these portholes open. 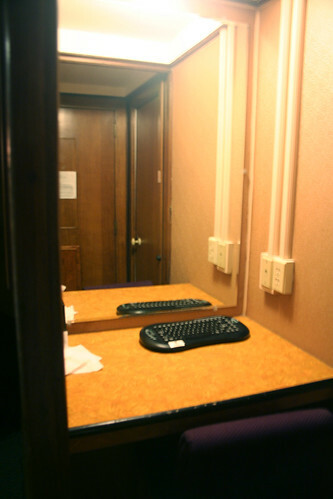 The bathroom is where I started to have my doubts. 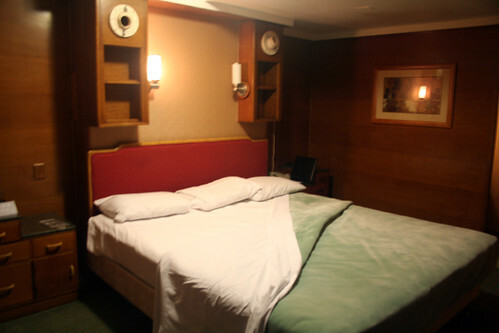 Had we really gotten a deluxe room? 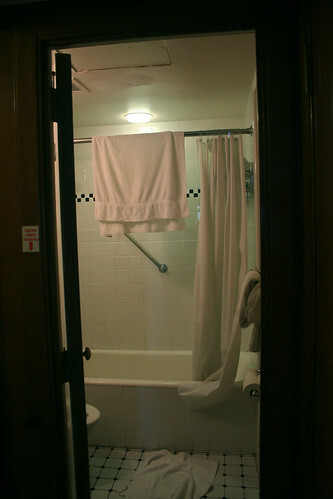 If I'd had the website handy, I could've stomped these suspicions by comparing photos, but the bathroom is where my ability to not even see water damage in the bedroom (scroll back up and look at the photos of the fan and the bed) suddenly ended. The tub? Clean, but grotty. 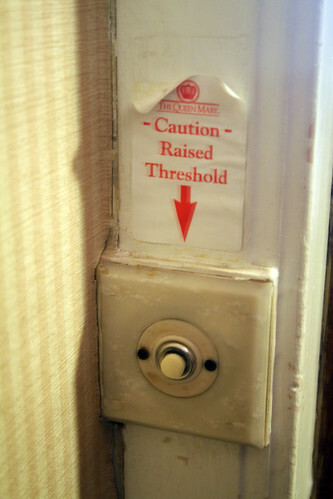 It put me off a hot bath. 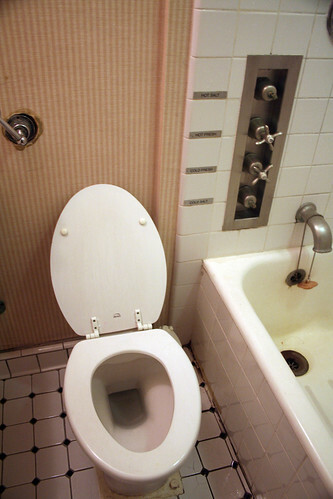 The toilet? Clean, but grotty. Broken tiles, discolouration and ripped wallpaper around the flushing device... 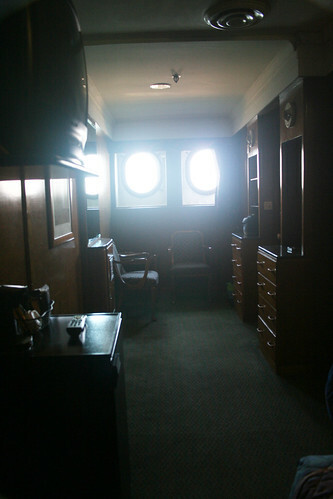 I didn't mind, because it all added to the ship's ambience, but I still felt like the "newly renovated" room was misrepresented. 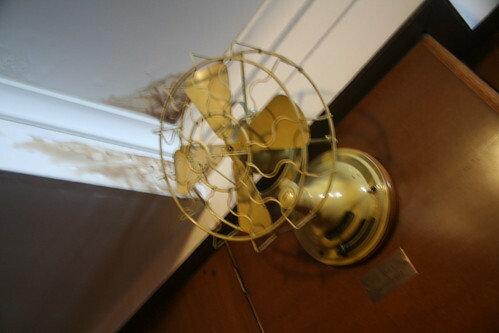 Now I put a squinty eye not only on the water damage by the fan (shown above) but on the bubbles in the ceiling. Once on the bed, they were hard to miss, as one measured a few feet across. Mike grabbed one of the smaller "pimples" and started pushing on it like a stress relief ball, but then wisely stopped courting possible disaster. Before we slept, we relaxed with some cold Bundaberg ginger beer, specially bought at Cost Plus World Market a few days before. 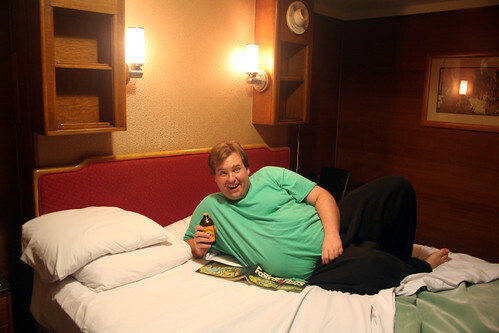 Mike reckons it may be the first time anyone has ever had Bundaberg aboard the QM (as well as possibly the first time anyone has read Footrot Flats there as well). 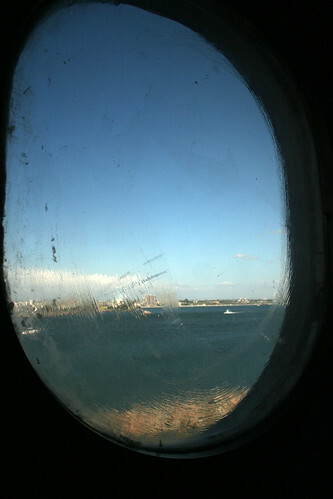 I took the porthole side, shown above, but we should have swapped. 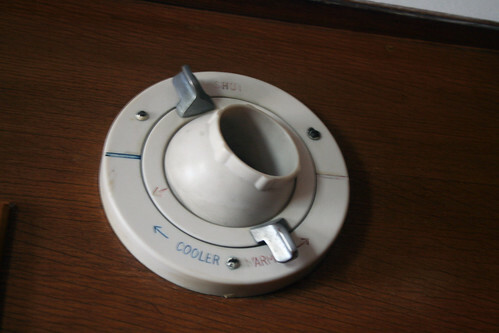 I was cold all night and Mike was hot, and when I walked over to the portholes in the morning, I found that whole section of the room to be icy cold. Gosh, you don't think that maybe, maybe, it was a... a GHOST?! 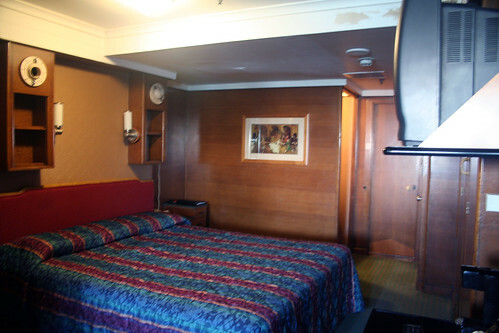 All in all, I understand why some people find the rooms disgraceful, but we were very comfortable and the room really is clean, just old in spots. Relish in the significance of the disrepair, and you're fine.